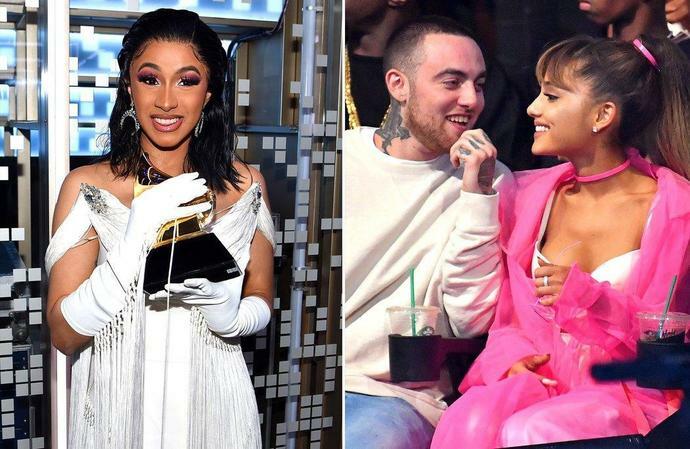 Ariana Grandehas some feelings about Mac Miller's Grammys loss toCardi B.
TheThank U, Nextsinger, whodid not attend Sunday's showdue to differences with producers, live-tweeted throughout the majority of the telecast - but the best rap album category had Grande particularly frustrated as Miller's fifth and final studio album, Swimming, lost to Cardi'sInvasion of Privacy. Though Grande, 25, tweeted, "f-" and "trash," she later clarified that she wasn't upset with Cardi who was not the "trash" to which she was referring. "Nothing to do w her. good for her. i promise. i'm sorry," she later wrote on Twitter. She told fans in another message: "She's not at all and that's not what i meant and u know that." Though he did not win, Miller was honored during the In Memoriam segment of the show. His parents, Karen Meyer and Mark McCormick, were also in attendance - and its their presence that seemed to most upset Grande. In response to another tweet about why the Grammys did not award Miller knowing his parents were at the show, Grande wrote, "this. this is what i meant. karen was gonna have a green suit made." Be sure to check outPEOPLE's full Grammys coverageto get the latest news on music's biggest night. Miller and Cardi were nominated in the category alongside Nipsey Hussle'sVictory Lap, Pusha T'sDaytona andTravis Scott'sAstroworld. Though Miller's album was not celebrated with a win by the Recording Academy, his music has been revered since his death. To honor his legacy and career, his family organized the"Mac Miller: A Celebration of Life" tribute concert in October with Miller's friends and collaborators like Scott, John Mayer,Chance the Rapper, Anderson.Paak,Miguel,SZAand Ty Dolla $ign performing. Miller isn't the only artist who has been nominated for the upcoming ceremony posthumously. RockerChris Cornell, who died in May 2017, won his 16th nomination in the best rock performance category for, "When Bad Does Good."